David Pilston is the CEO of Save Our Seabirds, Inc. The walkways inside the Save Our Seabirds compound lead past the enclosures of hundreds of birds who are too injured to be returned to the wild. The male pelicans will come and take sticks from visitors back to the females of the flock, so they can add to their nests. The Great Blue Herons are a majestic sight. When my sons were young, we used to go to the Pelican Man’s Bird Sanctuary all the time. 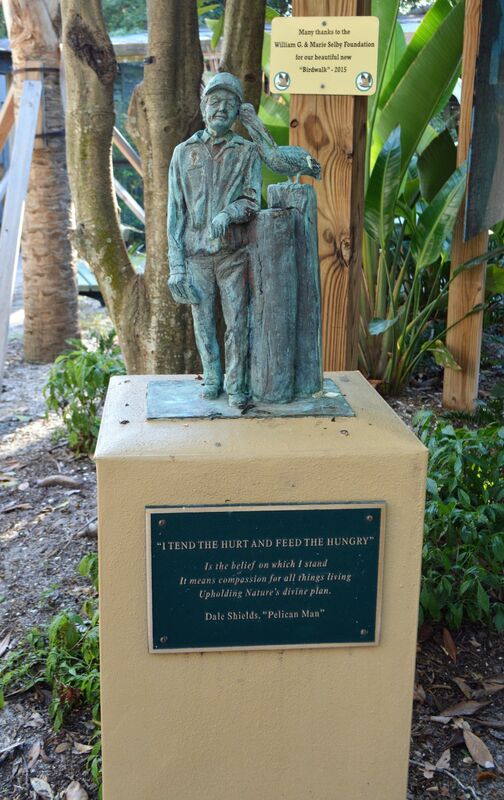 Dale Shields, the Pelican Man, had built a wild bird refuge on City Island, across the parking lot from Mote Marine Aquarium in Sarasota. It provided a wonderful opportunity to see beautiful, but tragically injured, seabirds up close, and to learn about how we regular citizens could better protect them. Shields passed away in 2003, 20 years after founding the sanctuary. After his death, the property gradually fell into disrepair and all of the birds who were living there were taken to other shelters to live out their lives. Luckily, the sanctuary was able to open back up in 2008 under new leadership, and with the hiring of their CEO, David Pilston, in 2012, it has now been returned to its former glory, and even improved upon. Now known as the Save Our Seabirds Wild Bird Learning Center (SOS), the sanctuary occupies about 130,000 square feet and is home to approximately 250 birds, consisting of more than 30 species, both native and exotic. Besides the rehabilitation and (fingers crossed) eventual release of the birds, SOS is all about education. When I first entered the sanctuary, I was able to watch a short film underneath the shelter where the Education Center is, that showed just some of the good work the non-profit does. Most touching of all was a part of the movie that showed a baby sandhill crane being released back into a field after his rehabilitation to his parents, who were still living there and obviously recognized their little one. Pilston explained to me that really, that is the ultimate goal—to rehabilitate these birds and get them back into their native habitat. In the meantime, though, they are well taken care of at SOS. At any given time, about 120 birds are back in the “hospital,” where they are being treated. But about 120 other birds are in enclosed habitats where visitors can see them. Those are the ones who have injuries that are too severe to be let go back into the world, because they would not be able to survive. It’s obvious that these birds are well-cared for and are used to being around humans. One of the most entertaining things I saw was someone running a stick along the fence in front of a group of male pelicans, one of whom then ran up to grab the stick. After he got his stick, the male immediately ran to the back of the enclosure, where the females were busy building their nests. The male offered his treasured stick to one of the females, who then immediately put it into her nest. And they say romance is dead. WHERE: 1708 Ken Thompson Parkway, in Sarasota. WHEN: It’s open every day, from 10 a.m. to 5 p.m. COST: Admission is $12 for adults and $6 for children aged 4 to 12. If you show a ticket from Mote Marine Aquarium, you get half off the SOS ticket price. INFORMATION: SOS is a non-profit organization, and as such, completely relies on grants and the public’s donations. Their big fundraiser is the Annual Selby Soiree, which is held each year in late March. To find out more, visit the website at www.saveourseabirds.org, or call 941-400-6779.